Kisuke Urahara's zanpakutou in sealed form is a shikomizue called Benihime which translates to "crimson princess". 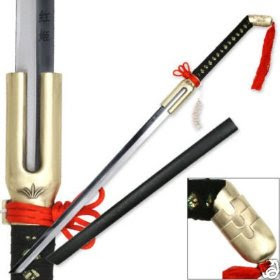 Shikomizue which literally means "prepared cane" is actually the name of the mounting where the sword blade is placed in, to conceal the fact that it is a sword and thus provide the element of surprise. 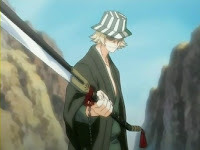 In Urahara's case, it is a walking cane stick and I guess it reflects Urahara's mysterious and reserved personality. This type of mounting was used commonly by shinobi (Ninja) in ancient days and made popular by the fictional blind swordmaster Zatoichi. 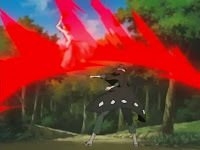 The sheathe of Benihime also has the ability to dislodge a soul from the body. 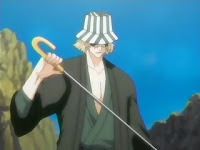 To release Benihime's shikai form, Urahara uses the command "okiro" or "awaken". In shikai form, Benihime's blade is wider and the hilt end bends at an angle. Its slim guard runs parallel with the blade which is rare among all zanpakutou. There are two red silk tassels attached to the guard and pommel. A short chain is also hangs from the guard. Benihime has two known special abilities activated by the command "nake" or "sing/cry". It creates a polygonal "blood-mist shield" which defends against most attacks and hurl a crimson energy blast similar to a cero. 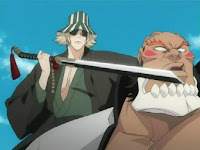 Urahara being a former captain of Gotei 13 has achieved bankai but it is yet to be revealed. Amazingly he achieved bankai in only three days. His previous comments suggest it's either insanely powerful or not an offensive type. 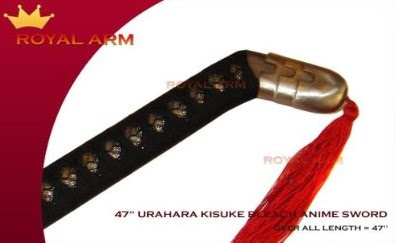 The Kisuke Urahara Benihime Sword replica from RoyalArm is a beautiful decorative sword with great attention to detail. The sword has an overall length of 47". The blade is made of 440 stainless steel and features a full-tang construction. Benihime Sword's guard and pommel have polished copper-like surface similar to the anime design. There were some replicas I came across on the net having gray-weathered black guard and pommel instead, and priced higher than RoyalArm's. 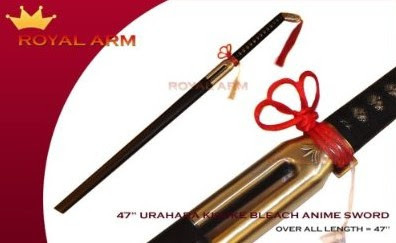 If there are no stocks available at RoyalArm which do happens occasionally due to sudden high demand, you can opt for the alternative Kisuke Urahara Benihime Sword replica from Collectible Cutlery.